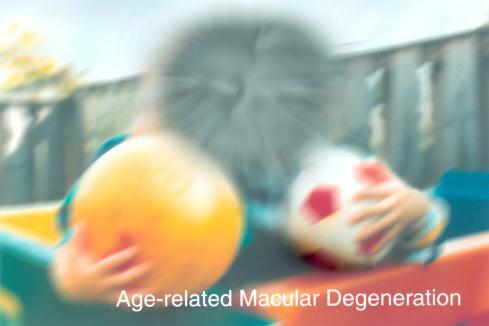 Age-related macular degeneration, or AMD, is a physical disturbance that affects the centre of the retina, called the macula. The macula is the part of the eye responsible for our most acute vision, which we use when reading, driving, and performing other activities that require fine, sharp, or straight-ahead vision. Dry macular degeneration: Small yellow deposits, known as drusen, accumulate under the macula. Eventually, these deposits are disruptive to vision cells, causing them to slowly break down. With less of the macula working, this causes a gradual loss of central vision as time goes on. This is the most common form of AMD, affecting approximately 90% of people who have the disease. Wet macular degeneration: New blood vessels start to grow in areas of the macula where they shouldn’t be. This causes rapid damage to the macula that can lead to the loss of central vision in a short period of time. Although this type of AMD affects only about 10% of people with the disease, it is responsible for 90% of severe vision loss associated with AMD. Click here for more information on risk factors. Since peripheral vision is not affected, many people with dry AMD continue in their normal lifestyles with the aid of low-vision optical devices, such as magnifiers. Wet AMD is treated with injected medications and/or laser surgery by sealing off the leaking blood vessels. These are usually brief and painless outpatient procedures that slow, and sometimes even reverse the progression of the degeneration. A small, permanently dark spot is left where the laser makes contact, however. There are currently no treatments for dry AMD, although the use of some nutritional supplements have been shown to slow the progression in those most at risk. Bausch + Lomb offers a line of eye vitamins specially formulated to provide nutritional supplementation for those at risk for macular changes and those diagnosed with dry Age-Related Macular Degeneration*. Ask your eye care professional if PreserVision Eye Vitamins are right for you. *The statements above have not been evaluated by the Food and Drug Administration. These products are not intended to diagnose, treat, care or prevent any disease.